The holidays are in full swing with only eight shopping days remaining. If you are like me, you're still out and about shopping for the perfect gifts for family and friends. Here are some uniquely Tennessee gifts for you to look for in stores or online. As the company says – just like Elvis, barbecue and the blues, ful (pronounced fuel) was born in Memphis. Inspired by music and the needs of traveling musicians, ful makes bags, backpacks and travel gear. Consider them bags with a definite fashion edge. Crafted with heavy padding, water-resistant materials and durable zippers, these bags are meant to take you around the world or down the street – even if you're not a rock star. About 15 years ago, this mother-daughter team dreamed of creating hand-made soaps along with other bath and body products with a natural approach to skin care. Today, Misty Mountain offers more than just soap from its 4,000-square-foot facility in the Great Smoky Mountains and two retail stores in Gatlinburg. Misty Mountain makes 50 varieties of soaps, salt and sugar scrubs, lotions, bubble bath and much more – even dog shampoo. Southern. Original. Delicious. These chocolates are all of those and more. Hand-crafted in Nashville, the award-winning artisan chocolates have unexpected flavors like Buttermilk or Mexican Cinn-Chili. Slow-roasted and stone ground in small batches, their chocolates are made from select beans and mixed with pure brown sugar to create what they call "Southern Artisan Chocolate." 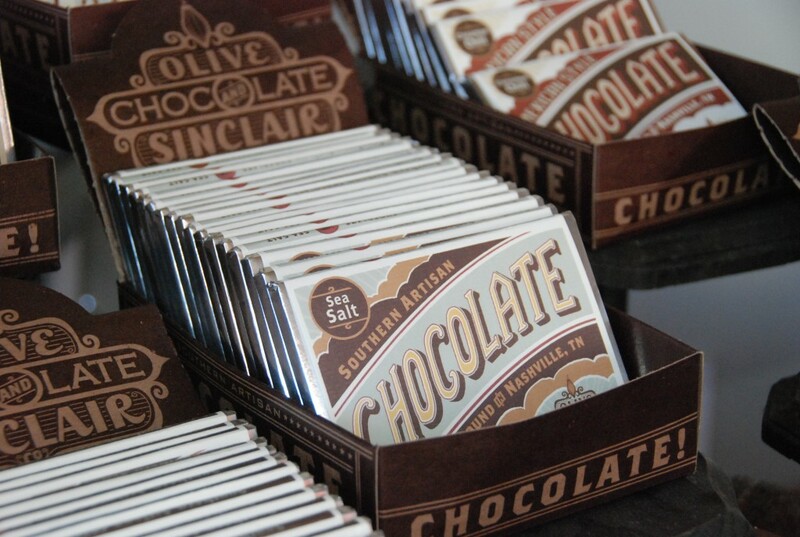 Olive & Sinclair can be found in retailers throughout the country or online. Tennessee's Pointer Brand jeans are a true original – 100 years in the making. Designers and fans of these traditional American jeans visit the Bristol factory every day to see the worn wood, vintage sewing machines and the know-how. It's all here in Tennessee and it's 100% authentic. A century of style and character, Point jeans can be found worldwide from high fashion boutiques in Hong Kong to co-op stores throughout the South. Visit their website to shop or find a retailer near you, . Last decade, the beloved Tennessee Pewter went up for sale. Since 1973, matriarchs had passed down the signature water pitchers, brides had registered for the goblets, and newborns had received the julep cups. Today, Tennessee Pewter creates some of the most stunning pewter pieces you will ever find. The nation's oldest registered distillery, Jack Daniel's Tennessee Whiskey, is celebrating 150 years of pouring fine, amber leaf gold into glasses in 2016. Celebrate this anniversary with any bottle of Jack be it Tennessee Honey, Single Barrel Select or Jack Daniel's Old No. 7. Gift a bottle of Jack that warms the heart. It has a bit of history and a whole lot of Made in Tennessee crafted in each sip. Adventure seekers, seek no more. Jackson Kayak is your ticket to year-long adventure in 2016 and should be at the top of your wishlist. The leader in whitewater, fishing and exploration boats, Jackson Kayak was founding 2003 by world-champion freestyle kayaker Eric Jackson and Tony Lunt, so you know your kayak will be top-notch for whatever thrill you decide to chase in the new year. You'll never look at shoes the same again once your feet have experienced the luxury of Edwards Shoes. Water buffalo, bison, ostrich hides are used to create signature, handmade leather shoes. Santa would be remiss if he didn't place a pair of these shoes under every tree this Christmas. America. Here you'll find blown glass, pottery, woodwork, paintings and more that have tradition and history crafted into each Made in Tennessee piece. Someone on your list have refined or sophisticated tastes? Gift them a bottle of wine from Kix Brooks' winery. Not only was the winery established by a country music star, the Vineyards have become "Nashville's Wine Country." Shipping wine is easy as the winery does so to thousands of club members in 25 states. We specialize in bags, backpacks and travel gear. Handmade soaps, along with bath and body products.